Tehachapi residents can now begin the process of purchasing home security and Ring video doorbells through a city-sponsored program, with the goal of reducing neighborhood crime. The application timeline runs April 17 through May 31, or until the funding limit is reached. “We are excited to give our residents the opportunity to add Ring security cameras to their homes. The use of these security devices will enhance the safety of our residents, improve their quality of life, and help reduce crime in the city,” Tehachapi Police Chief Kent Kroeger said in a police news release. Ring video doorbells allow the home's occupant to monitor visitors when the doorbell rings. This is done through the user’s smartphone or tablet. If users wish to save video to view at an another time, other fees are required. The City Council heard a presentation about the proposed project Feb. 4, and unanimously voted in favor of the agreement with the security company. The city will offer — in partnership with Ring LLC — video and camera doorbell technology for 100 city residences at a discounted price. Residents have the opportunity to receive discounts anywhere from $79.99 to $149. An application soon will be posted online on the city's website at liveuptehachapi.com. “We’re excited to partner with Tehachapi to make our security doorbells and cameras available to local residents at an even more affordable cost,” Jamie Siminoff, chief inventor and founder of Ring, said in a city news release. 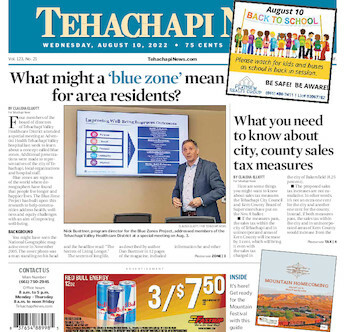 “Even without a Ring device, Tehachapi residents can connect with one another and stay up-to-date on local crime and safety information by downloading the free Neighbors App by Ring. When neighbors, the Ring team and local leaders all work together, we can create safer communities and reduce crime in neighborhoods." Subsidy codes are limited to one per household and cannot be re-used or applied toward previously purchased Ring products. Residents will also need to pay an additional subscription fee if they would like to save device footage or sign-up for the alarm monitoring service. For more information about Ring’s products, visit Ring.com/products.